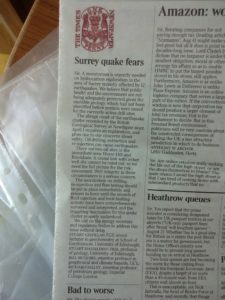 “The abrupt onset of the earthquake cluster recorded by the British Geological Survey at Newdigate since April 1 requires an explanation, and gives rise to our concerns about safety. Oil drilling, extraction and re-injection can cause earthquakes. “There are two oil sites in the immediate area: Horse Hill and Brockham. A causal link with either well site cannot be ruled out, so we need the full picture for the risk assessment. Well integrity in these circumstances is a serious concern.